This week, members of Delfos Danza Contemporanea traveled from Mazatlán, Mexico to join BDF. They will be performing tonight and tomorrow in Schaeffer Theatre at 7:30pm. Despite hours of rehearsal for “When the Disguises are Hung Up,” they have been able to participate in the Festival by taking class, hanging out in the dining hall, and activating the BDF mission to share the dancing magic we create here with the greater community. 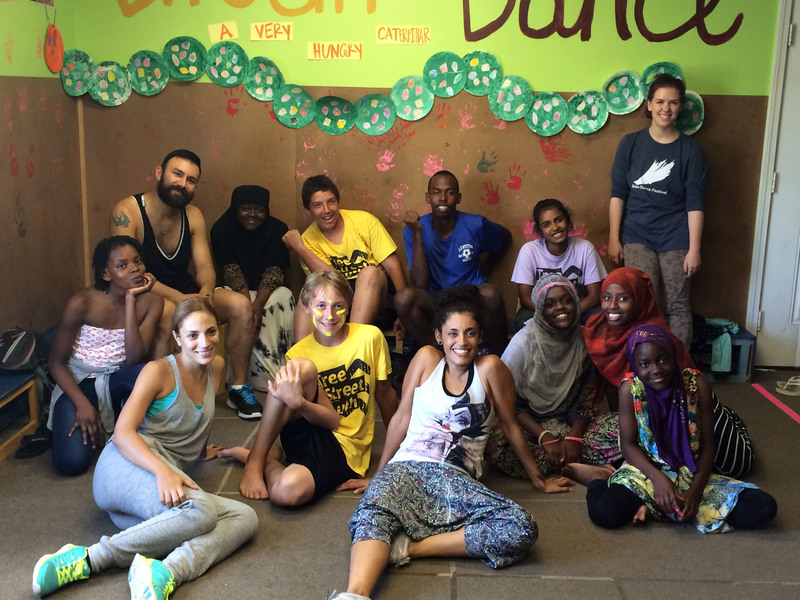 This Wednesday afternoon I accompanied three members of the company, Rosi, Aura, and Johnny on a visit to Tree Street Youth in Lewiston, where they led a dance workshop. I got in the car not really knowing what to expect. I only knew that Tree Street is a community center where youth can participate in free activities after school and during the summer. Five minutes away from campus I pulled up in front of one-story building with windows painted with brightly colored designs and a high energy basketball game happening right next door. Inside the doors sat three teens on a colorful couch laughing about something together. We walked past them and through the entryway, toward the happily shouting voices from an adjacent room. I wandered into the room, which was filled to the brim with teenagers, searching for an adult to tell us where to go. I found a woman wearing a purple Tree Street shirt and she helped me find Fabiola Navarrette, Tree Street’s Arts and Cultural Enrichment Coordinator and our host. Fabi told us that glow-in-the-dark yoga was wrapping up in the space we were going to use, and offered to give us a tour while we waited. As we followed her through the winding hallways into brightly colored rooms, Fabi gave us a run-down of Tree Street’s mission: to provide a safe, enriching place for Lewiston-Auburn youth and provide support through academics, athletics and the arts. While she talked, we passed groups of teens playing board games, writing in notebooks in quieter rooms, and racing around to complete a scavenger hunt. When our tour was over, we still had a little bit of time to wait in the entryway with the laughing teens on the couch. I wandered around examining the colorfully decorated walls, one of which displayed college acceptance letters and certificates for achieving honors in high school. As I looked at a collage of pictures of smiling kids, teens, and Tree Street staff, I overheard Aura and Rosi introducing themselves to the teenagers. They were impressed to learn that Aura and Rosi are professional dancers, and infinitely curious to hear about what exactly that meant. One girl shyly said she loves dance and art, and Aura encouraged her to join us. When glow-yoga wrapped up, about ten teens joined us in Tree Street’s designated room. Rosi, Aura, and Johnny wasted no time, briefly introducing themselves and Delfos before asking the teens to stand and face the front. Johnny put on an upbeat song and Rosi lead the room through a full-body warm up. Afterward, Aura took over. She taught a short string of movements, each connected with a sound. The teens practiced the movements over and over with Aura, making the music themselves, until they could do it without her help. Then Johnny taught a new string of movements, this time connecting each one with a count. He led a call and response as they practiced, teaching the room how to count in Spanish. Rosi followed with her string of movements, and then they asked the teens to put them all together. Once everyone felt comfortable with the phrase, Rosi divided them into groups to show off their new moves. As the music played, the teens cheered each other on and the support and trust they have between one another became evident. Everyone in the room was there because they really wanted to be. Dance was a common love for all of us, even though we came from all over the world. Tired out from all the moving, everyone sat in a circle to wrap up our time together. Aura told the teens how lucky they are to have a place like Tree Street, explaining that there aren’t places quite like it in Mexico. Our hour together was coming to an end, and Rosi, Aura, and Johnny began to pack up their things. One of the teens asked if they could show off a dance they learned the day before. 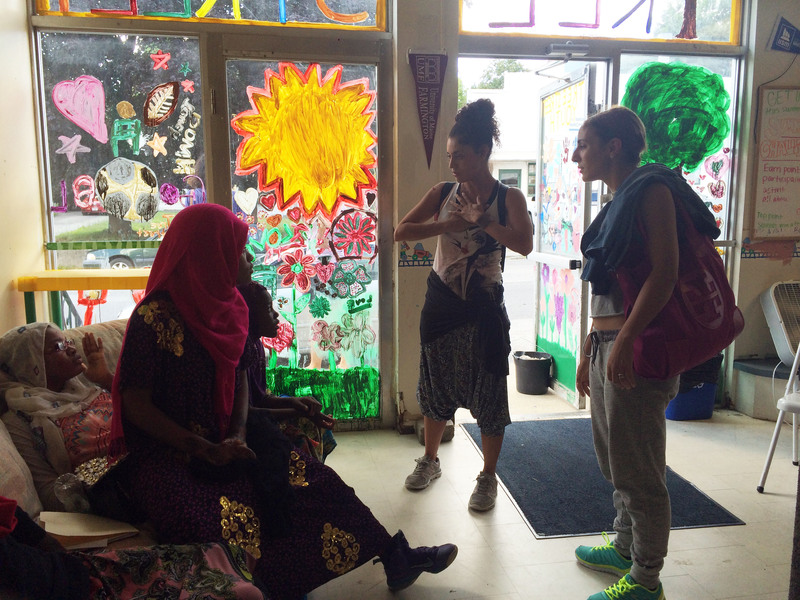 A student at Bowdoin College spends her time at Tree Street teaching Bollywood classes, one of which was the day before we arrived. She cued the music and off the teens went, stepping and hopping and hip shaking around the room with bright smiling faces. Rosi, Aura, Johnny, and I were smiling too, excited by the energy and promise these young dancers have. My smile stayed in place on the drive back to the Bates College campus. What I had just experienced was very different from the rest of my festival experience, and it exemplified the Festival’s outreach into the local community as well as dance’s ability to bring people together. In just an hour, Rosi, Aura, and Johnny engaged in a cultural exchange with those teens. They provided the dance moves and the insight into the professional world, Tree Street provided a dose of un-adulterated happiness and excitement about art. To be able to witness it was a privilege I hope to have again soon, because who doesn’t want to watch dance magic happen before their eyes? See their dancing here and here!